The 28th Annual James Beard Foundation Awards, known as the Oscars of the food world, is expected to draw thousands of chefs, restaurateurs and food writers to Chicago in the first week of May. Tickets to the much-anticipated May 7 ceremony are selling fast, but that’s only part of the James Beard celebration. James Beard Eats Week, held April 27 to May 7, features culinary creations from more than 100 area restaurants and top chefs, each creating James Beard-inspired dishes that fall within a reasonable budget. Foodies can stop by Homestead on the Roof’s rooftop restaurant and famed 3,000-square-foot organic garden in West Town (1924 W Chicago Ave), where Executive Chef Scott Shulman takes his inspiration from a James Beard quote: “Too few people understand a really good sandwich.” In honor of the statement, Shulman is taking a classic Chicago-style Italian Beef — preserved in duck yolk — and crossing it with a steakhouse staple, tartare. The sandwich will feature giardiniera, roasted red pepper puree, jus gelee and house baked roll. Another sandwich ode to Beard comes from Executive Chef Mark Bires of Jerry’s Sandwiches. Between two slices of challah, “Beard’s Best BLT” features applewood bacon, heirloom tomatoes, red onion, arugula, lettuce and bacon fat aioli. Jerry’s has locations in Andersonville (5419 N Clark St) and Lincoln Square (4739 N Lincoln Ave). For breakfast with a Beard twist, Upstairs at The Gwen (521 N Rush St) is serving up a Slagel Farm Duck Egg Scramble for under $20. The dish, created by Executive Chef Matt Jergens, incorporates veal sweetbreads, morels, charred ramps, foie gravy and brioche. That, however, is only the tip of the proverbial iceberg. Here’s your guide to Eats Week’s Beard-inspired dishes around the city (stay tuned for more restaurants being announced as Eats Week approaches). For an up-to-date list of participating Eats Week restaurants, please visit choosechicago.com/JBF. FYI: Also check out the James Beard Foundation Eats Week Dinner Cruise on Odyssey (Navy Pier) from April 27-May 7, featuring a three-course menu with specialty, James Beard-inspired dishes. James Beard-inspired dishes: Japanese ginger apple mesclun salad with orange vinaigrette. Sliced wagyu sirloin with balsamic teriyaki glaze, sprinkled with volcanic wasabi salt. Lavender honey ricotta cheese tart with frangelico marinated berry topping. James Beard-inspired dish: Beef short ribs with saffron risotto. James Beard-inspired dish: Peipar quail roasted 5-spice brine, maltose cured, dry-aged quail. James Beard-inspired dish: Watermelon mojito and grilled whole fish. James Beard-inspired dishes: Wild mushroom, runny egg, sherry-jus. Spring peas, squid sausage and piperade toast. James Beard-inspired dishes: "Jucy Luciano" stracchino cheese, crispy pancetta, roasted cherry tomatoes, lemon arugula, spicy salsa rossa and focaccia bun. James Beard-inspired dish: Tequila-braised short ribs, root vegetables and serrano mint salsa. James Beard-inspired dishes: Ensalada - vegetable (raw) ribbons, smoked eggplant pure, vadouvan, lemon yogurt dressing. Cordero - rack of lamb, apricot, mustard curry, roasted chickpeas. Chocolate - chocolate tangerine tart, chocolate mousse, popcorn mousse cocoa powder. James Beard-inspired dish: Poke bowl with bulgur wheat, ahi tuna, avocado, shaved radish and cabbage, cilantro and ponzu dressing. James Beard-inspired dish: Mini pork meatballs with kimchi peanut pesto and toasted steamed buns. James Beard-inspired dish: Braised short rib of beef, in a rich G.D. Pigeon Porter beer and an artisan honey reduction. Served with mashed potatoes, grilled asparagus and baby carrots, fried leeks and garnished with a blistered tomato. James Beard-inspired dish: James Beard’s steak tartare -- scotch, quail egg, dijon, capers and cornichons. James Beard-inspired dishes: Three course prix fixe - roasted yellow pepper soup with creme fraiche; seared ahi tuna salad nicoise; pound cake with cognac-infused golden raisin ice cream. James Beard-inspired dish: Le eouf-soft scrambled egg, runny yolk center, chives, osetra caviar tartine and creme fraiche. James Beard-inspired dish: Shaved asparagus salad with green goddess dressing, tarragon aioli and parmesan. James Beard-inspired dish: Sliced filet mignon topped with braised short ribs, served with Vermont white cheddar, rosemary polenta and a Fuji apple horseradish compote. James Beard-inspired dishes: Pacific manila clams, nueske&apos;s bacon, fennel, onions, white wine, sourdough crostini. Fried oysters, English peas, lemon, black pepper. Aioli-braised lamb shank, cannellini beans, tomatoes, polenta. Baked Alaska, thai coconut cake base, mango ice cream, caramel and lime creme anglaise. James Beard-inspired dish: Oxtail croquette with gremolata and dried beef. James Beard-inspired dishes: A curated collection representing each one of the members on Chicago Firehouse&apos;s culinary team. James Beard-inspired dishes: Fried alligator with creole remoulade. Whole smoked red snapper with baby green salad and lemon thyme beurre blanc sauce. Chocolate mousse pie with caramel and chocolate graham cracker. James Beard-inspired dishes: James Beard onion sandwich - brioche, sweet onions, aioli, parsley. James Beard breakfast croque - sweet slaw, smoked ham, comeback sauce, sourdough and Mornay. James Beard-inspired dishes: Mixed-greens salad with blue cheese, poached pears and cherry vinaigrette. Barramundi with fennel salad and citrus and mango relish or tournedos of beef au jus with creamy polenta and pearl onions. Vanilla panna cotta with huckleberry compote and blueberry sorbet. James Beard-inspired dish: Cherry and watercress salad with puglian burrata, toasted pistachios, pickled shallots and a lemon citronette. James Beard-inspired dish: Paul Bocuse green circle chicken fricassee with morels and a la anglaise mirepoix. James Beard-inspired dish: Brown butter cake with hibiscus-poached rhubarb and candied amaranth. James Beard-inspired dish: Herb and Porcini Spätzle - smoked duxelle, fresh chickpeas, bok choy, roasted peppers, crème fraiche. James Beard-inspired dish: Eli&apos;s Honest Abe Cheesecake - rich and creamy goat&apos;s milk cheesecake baked with fresh, caramelized apples, topped with cardamom honey caramel. James Beard-inspired dish: Grilled pork belly, braised lentils, pomegranate jus and chermoula. James Beard-inspired dish: Seasoned pearled barley salad with navy beans, tuscan kale, sweetened dried cranberries and roasted butternut squash, topped with maple-chili spiced walnuts. James Beard-inspired dish: Rhubarb raspberry verrine -- roasted rhubarb, white chocolate raspberry cream, rosé syrup and genoise. James Beard-inspired dish: House-made spaghetti with baby clams, green garlic and chiles. James Beard-inspired dishes: Gene & Georgetti Chicago will be honoring James Beard Eats Week with drinks! Grasshopper - like a chocolate after-dinner mint in a glass: 1 oz. green creme de menthe, 1 oz. white creme de cocoa, 1 oz. cream. Irish Bulldog - a play on the classic Colorado Bulldog recipe: 1 oz. Jameson Irish Whiskey, 1 oz. Baileys Irish Cream, 1 oz. Coca-Cola. Pot O&apos; Gold - 2 oz. cucumber vodka, 1/4 oz. St. Germaine Elderflower Liqueur and ginger beer. 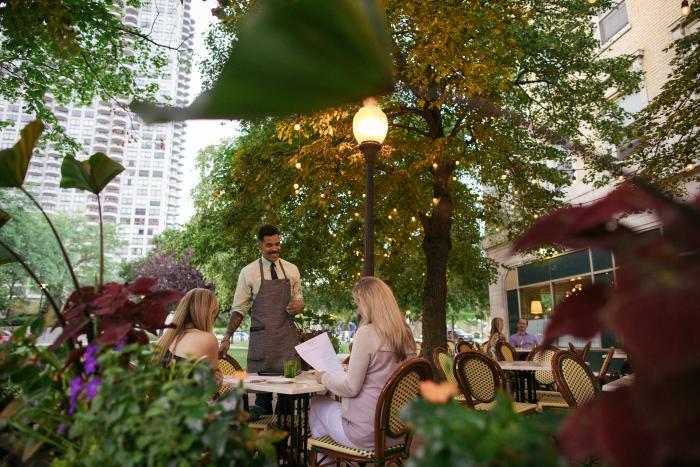 James Beard-inspired dishes: Gene & Georgetti Rosemont will be honoring James Beard Eats Week with drinks! Enjoy an East India Negroni, Bayou Sour, The Stinger, Oceanside Royale or James Beard&apos;s Favorite Bloody Mary. James Beard-inspired dish: Classic Chicago-style Italian Beef crossed with a steakhouse staple, tartare - house-made Italian Beef, preserved duck yolk, giardiniera, roasted red pepper puree, jus gelee and house baked roll. James Beard-inspired dish: James Beard’s Best BLT - applewood bacon, heirloom tomato, red onion, arugula, lettuce, bacon fat aioli and challah. James Beard-inspired dishes: Antipasti tomato soup, seasoned ricotta, basil and pancetta dust. Whole wheat fettuccine broccolini, fennel, leek and onion puree. Dolci chocolate, budino-candied grapefruit, hazelnuts and fennel. James Beard-inspired dish: Compressed melon salad with avocado, blueberry granola and radish. James Beard-inspired dish: Crispy goujonettes of dover sole with lemon, parsley and remoulade. James Beard-inspired dishes: James Beard "taste of mfk" - Aguachile, poached shrimp, avocado tapas, anchovy, boquerones, mussels escabeche. From the fryer - croquettes, prawn heads, sherry garlic aioli. Roasted cauliflower - pickled sweet peppers, toasted breadcrumb. Albondigas - bizkaina, polenta, red onion jam. Seafood videos - shellfish, piperade, saffron-cream; basque cake. James Beard-inspired dishes: American wagyu ribeye steak with miso chili glaze and roasted oyster mushrooms. James Beard-inspired dishes: Chef’s surprise - calamari shrimp, candied ginger and lemon. Watermelon radish sake. Guacamole. Butternut squash ravioli fennel. Prosciutto. Crispy sage. Walnuts. New Zealand venison Pâté. Hazelnuts. Parsley-apple salad. Berry gel. Poilâne and brioche toast Golden beets Warm goat cheese Artichoke pecans. Belgian endive. Watercress. Seasonal sorbet. Choice of entrée - organic Norwegian Fjord ocean trout elote; butternut squash; turmeric; poblano eggplant; heirloom carrots; chanterelles broccolini; parsnip; fennel; leek-basil broth; wild Delaware skate; fennel; broccolini; cauliflower; porto; chef’s pastry selection. James Beard-inspired dish: Black truffle and duck risotto - black truffle, duck confit, parmesan and truffle oil, with fresh truffles shaved tableside. James Beard-inspired dish: Wild striped bass, river valley ranch mushrooms, three sister’s garden pea shoots and caper browned butter sauce. James Beard-inspired dish: Oxtail cheesesteak - oxtail, sweet onions, horseradish havarti on toasted french baguette. James Beard-inspired dish: Green Beans and Clams - tomato, nduja and brown butter spread and honey vinegar. James Beard-inspired dish: Fava bean risotto - Crispy guanciale, morels, charred spring onions and parmesan cheese. James Beard-inspired dish: Cold shaved pork loin, potato salad and apple relish. James Beard-inspired dish: Sidewalk Chicken - five-spice seasoned chicken baked in salt and cut tableside before tossed with five-spiced tofu, green onions, serrano chili peppers and sesame oil. James Beard-inspired dish: Sunchoke hash, duck heart, farm onion, quark cheese and sunny duck egg. James Beard-inspired dishes: Espàrragos y quesos españoles - asparagus spears wrapped with smoked Atlantic salmon in a homemade crepe, served with a cheese platter of Manchego Mahon cheeses, caramelized olives and smoked tomato marmalade. Croquetas y Buñuelos - a crab meat croquette with vegetables and saffron rice fritters topped with Cabrales blue cheese and tomato concise. Plato Combinado del Mar - grilled langoustines and crusted cod with pistachios, served with sautéed seasonal vegetables and blood orange butter sauce. A la Plancha - grilled lamb chops and pork tenderloin wrapped in bacon served with sweet potato puree, spinach and a red wine sauce; spanish-style bread pudding and vanilla crepes filled with mascarpone cheese custard served with blueberry compote. James Beard-inspired dish: Shrimp "Cioppino" alzonicchi, creamed spinach, radish, pea shoots, asparagus, salmon roe and cioppino butter sauce. James Beard-inspired dishes: Seasonal amuse bouche starter; JB Famous Onion Sandwich - chicken liver mousse, carrot, onion and pickle; (choice of main) Chicken breast curry - tom yum broth, cilantro, peanut or steak au poivre flambé - galette potatoes, haricot verts; whiskey cake - marinated cherries, whipped crème fraiche. James Beard-inspired dish: Slagel Farm Duck Egg Scramble - veal sweetbreads, morels, charred ramps, foie gravy and brioche. James Beard-inspired dishes: Insalata di Finocchio e Ricotta Saffron - pickled fennel, lemon ricotta, blood orange segments, chicory leaves, rosemary vinaigrette and chestnuts. Pesce Branzino con Gnocchi di Mandorla - sea bass filet pan seared in a butter white wine sauce, house-made gnocchi and trapans pesto. Dolce Zeppole con Gelato di Menta - fried dough filled Ricotta, sprinkled with lavender powdered sugar and mint gelato. James Beard-inspired dish: Crispy pig face, gnocchi, peas, house bacon, pea shell brodo and cured egg.